Howth is a beautiful place. I really like this playground there. 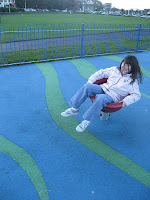 They have this big wheel and you sit on it and then it twirls around. You just go in a little circle! An then there is this thing and you sit on it and it shakes and wiggles and it can be so much fun - and it can hold three or four people on it. There is a bookstore, and its really cool. They have all these grownup books and a few Simpsons books. Howth is a good place to go, if you are in Ireland. We went to this little pub called the Abbey Tavern and we ate chicken gougons and chips with some ice cream and I had chocolate and vanilla. It was very fun. Howth is really really cool. They have all this really cool stuff. At the bookstore there was... before.. it was rebuilt... there were pictures of before it was rebuilt. It looked like, no roof - just like, little things and it was all rocky and it would be a very bad place to live. Every day I open one little box that has a chocolate in an advent calender. The chocolate is either bumpy or smooth. At the end when I'm all done with the advent calender, then, it will be Christmas! Christmas is really really fun. At Christmas time, our family opens presents and we have this big Christmas tree and it has lots of ornaments and I got one ornament of a puppy from school and its name is Pikachu. I like to name it that. Pikachu. I love Puppies! I really like it in a movie when a dog chases a cat. Its really silly. Cats are really really cute and fluffy. I don't like them as much as dogs. Dogs are more playful than cats. And cats just walk around and be lazy, but dogs are really playful and they jump up and you could play ball with them. It's just really fun. I love your blog, it's so cool. I used to have those chocolate adventcalenders but I ate all the chocolate on the first day:( I can't spell so I hope you can understand me anyway. We should hang out soon. Wonderful blog! I've been to Abby Taverne and it is very fun. I loved the story about your brother. You are a pretty special young lady.